Time for some mobile goodness from Sungift Games. We all know at least one – that person who always has their eyes glued to their iPhone (or iPod Touch, or iPad). Whether they are commuting, relaxing, or attending family functions, their iOs device of choice has their entertainment needs covered. What could be a better gift than a shiny new iTunes code for a beautifully drawn game? 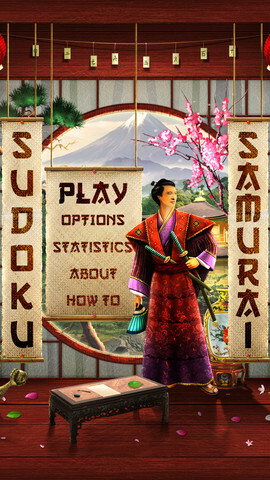 Sudoku Samurai features soothing music, impressive artwork, and some highly addictive sudoku action. We have ten codes to giveaway, so try your luck! There are fun ways to enter! Give us a shoutout on twitter (be sure to mention @GamesFiends and the game you want to win). Sometimes we have Retweet games for immediate gratification – be sure to follow us! Show our Facebook page some gamer love. We often have posts with the specific game link – we like wall posts and link comments. Be sure to like us so we show up in your newsfeed. Riddle me this in the comments below: If a train leaves the station at 9 am going 10 miles per hour….just kidding! What do you want Santa to bring you for Christmas this year? Follow us on Pinterest and repin the game you want to win! Feel free to leave comments, too. We love comments! As with all our 30 Days of Giveaways freebies, the winners will be doled out throughout the length of the giveaway.